If it has seemed a bit quiet around here lately, that’s because my family and I have spent the last two weeks visiting my parents in my hometown of Greensboro, N.C. It’s a long way to travel, especially with two young children, but worth it. Actually, Greensboro is nice place for children at this time of year (before the oppressive summer heat) and has lots of parks, gardens, and other little attractions. The main attraction for me, other than spending time with my family, was to catch up with the local minor-league baseball team, the Greensboro Grasshoppers. In all, I saw 2.5 games (we went to a double-header, but the first game went extra-innings, so we only stayed for half of the second). In those 20-odd innings, the Grasshoppers only managed 2 runs, both on solo homers… Even though all three games were loses – hot dogs and crackerjacks were eaten, great plays were witnessed, one window was shattered, one t-shirt thrown into the crowd was caught, and one baseball cap was purchased! The cap, however, is not for the Grasshoppers. 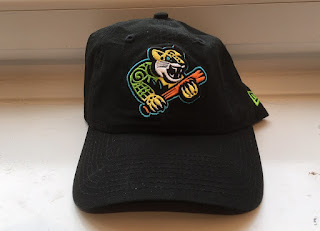 It turns out, later this season, the team will be changing its name to the Ocelots for 8 games in order to celebrate the many Hispanic players who have come through the organization (and to sell suckers like me another hat). Anyway, I couldn’t resist the bright, colourful Ocelots logo. I suspect I now have the only Ocelots de Greensboro hat in the whole of Britain! (Although if this not the case, I’d love to hear about it!). We also managed a quick trip to see my aunt in Arden, N.C., up in the mountains. We went on a walk to a lovely waterfall, swollen by recent storms, saw a copperhead, and ate lunch at a place that served ‘corn nuggets’ – described to me as ‘deep-fried creamed corn’. Anyway, we are home now, struggling to get the kids back on a normal sleep schedule. Lots to catch-up on, lots to do. Last year, I picked up this little ‘moon base’ set from Brigade Models at the Tabletop Live show in London, and have finally gotten around to painting it. Well, in truth, most of the paint is just sprayed on, but I don’t think it looks any worse for that. 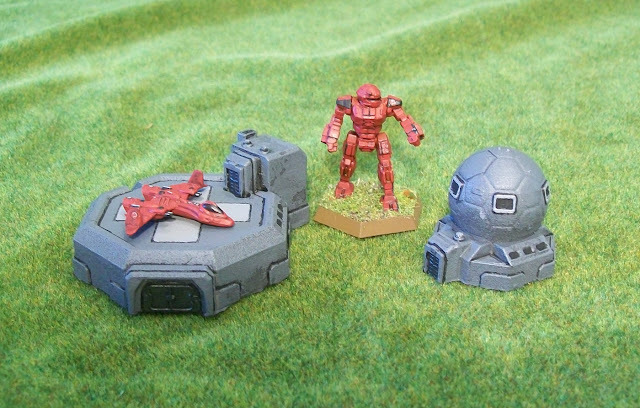 It makes a great little objective set for Battletech, or any other 6mm game really. As you can see, the landing pad is the perfect size to hold a Silent Death fighter. 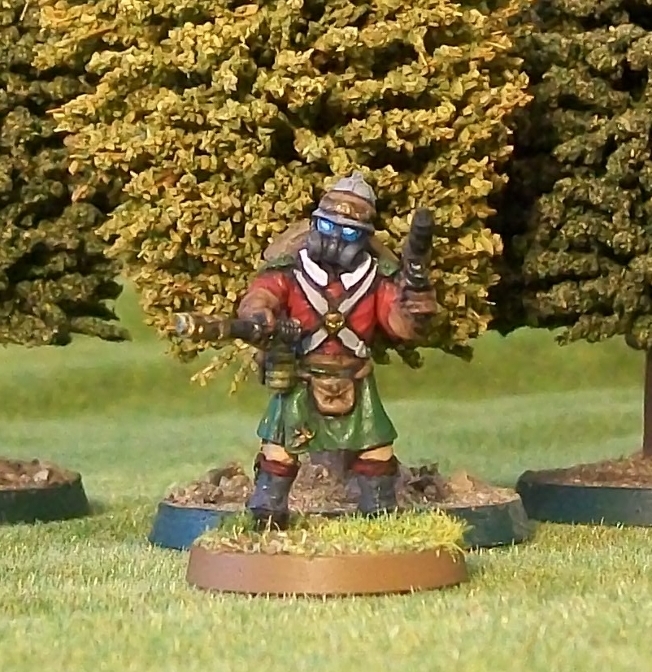 I also did a quick paint on a Kurita Commando. Since, the Draconis Combine forces are generally the ‘bad guys’ in my game, they don’t get the good paint jobs! I like the idea that this is some remote outpost, so low priority that when they asked for military support, they got a single light mech. 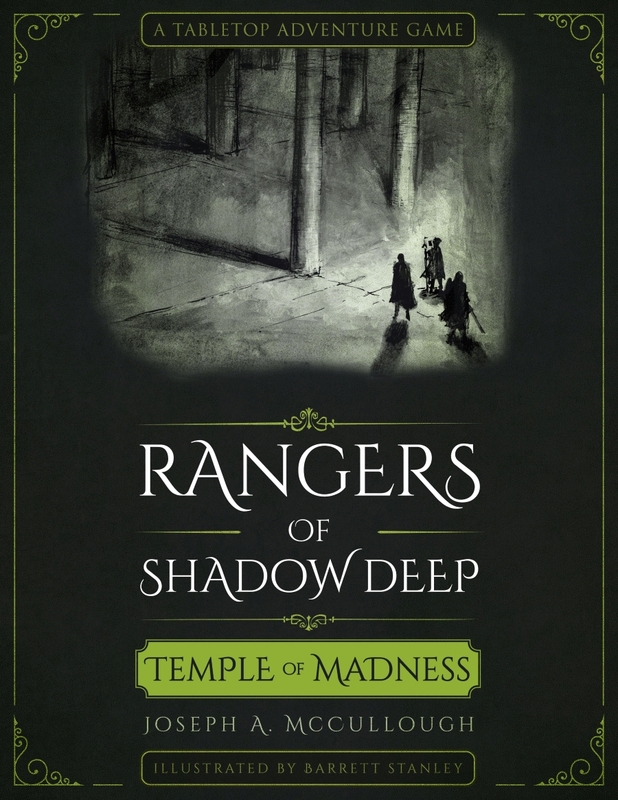 For Rangers of Shadow Deep fans who love paper - good news! That's really all I've got to say today. 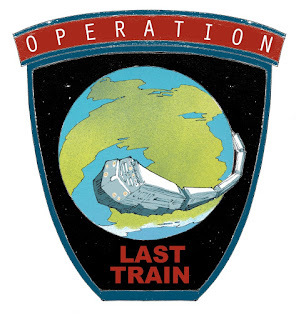 Just finished painting my third volunteer for Operation: Last Train. This figure uses a mix of pieces. The legs, arms, and backpack come from Victoria Miniatures, while the torso and head come from Anvil Industries. 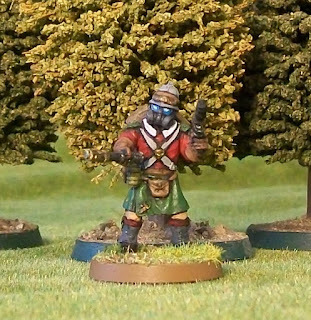 I also added a GW grenade and pouches for visual interest. Sgt. Mattius Kairn is a member of the 12th Kothian Genadiers, a storied regiment with numerous battle honours. 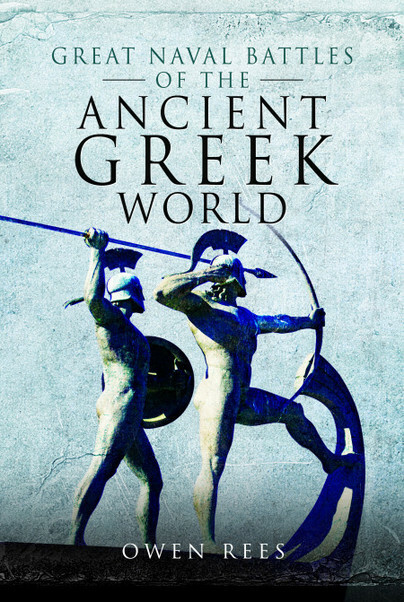 Some years ago, when still just a private, Mattius was horrifically scarred by acid. Due to this scarring, he prefers to wear a hazmat-mask into battle, even when not strictly necessary. 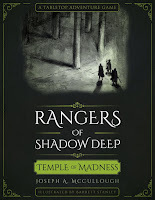 A specialist in hand-to-hand combat, there are a few that whisper that Mattius has a death-wish. 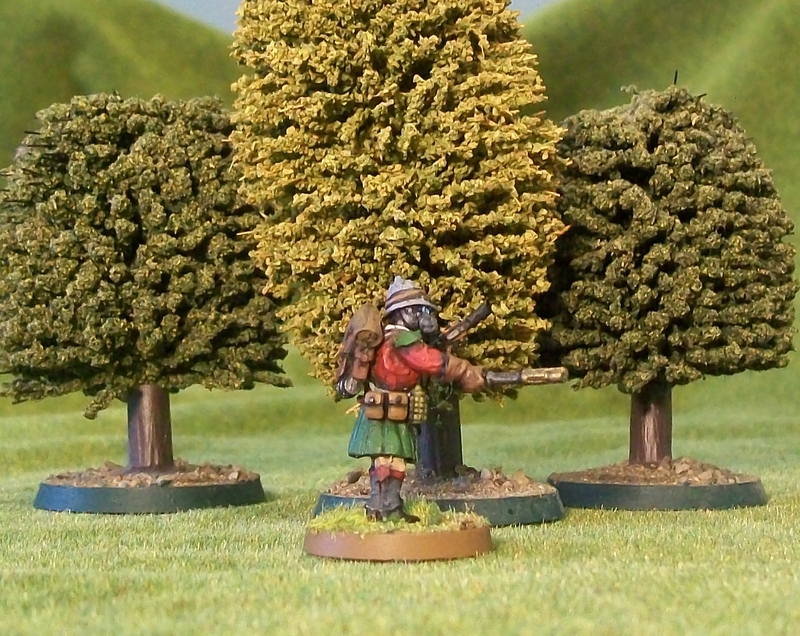 These rumours were only enhanced when he volunteered to join the Operation. Regardless of Sgt. Kairns motivations, there are none who have fought with him who doubt his courage and his devotion to the men under his command. Painting this figure started in frustration. I made a couple of attempts to paint a tartan, but both failed, so I gave up and just made the kilt green. Thankfully, the rest of the painting experience proved enjoyable. It’s fun painting light colours over a dark red background as you get some really good contrast. Also the ‘eyes’ of the mask came out really well. Another very pleasing addition to the Operation. 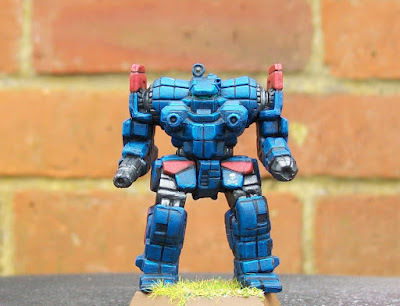 That’s not me being self-congratulatory about my painting skills, that’s actually the name of this specific battlemech. It’s an ‘Awesome’. That said, before starting on this guy, I decided that I had been getting a bit lazy about my mech paining, just trying to finish them as fast as possible, and not really enjoying the process. So, when I started painting this guy, my goal was to see if I could ‘up my game’ and really paint him to the best of my ability. In practical terms, this meant painting a lot of little black lines. 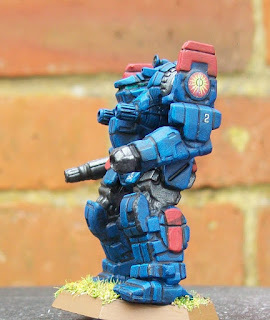 I kept the same blue, red-detail, colour scheme that I have been using on my Firehawks Legion, but this time I went with several layers of both colours and relied less on black washes. 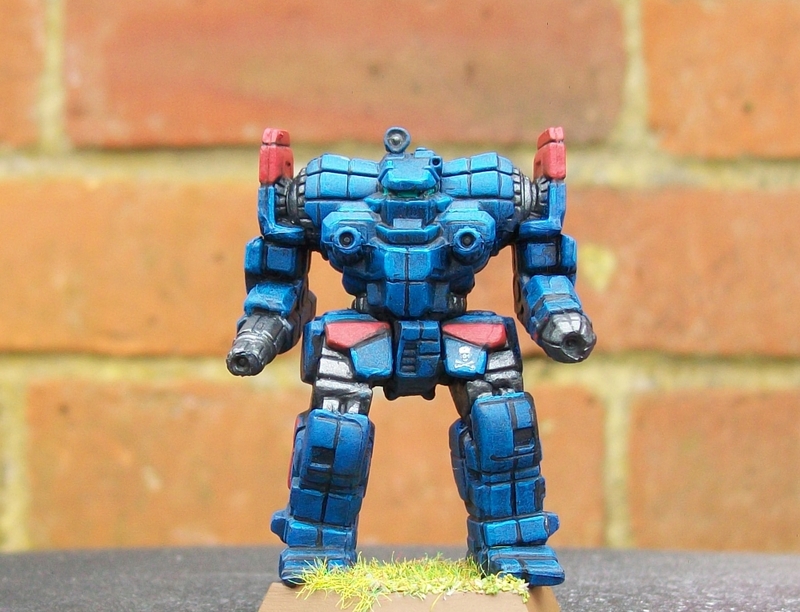 I also left a few parts of the mech ‘unarmoured’, but which I mean I painted them metallic. Finally, utilizing my new-found love of decals, I applied several. First and foremost I gave him a big Federated Suns insignia. This mech actually comes with a perfect circular area to apply it, and even allowed me to use one of the bigger decals I’ve got. There is a corresponding spot on the other side of the mech, but I have left it empty for the moment, as I’m hoping to get some ‘Firehawks’ decals to apply later. I gave him a little skull and crossbones (from Robotech) decal on his thigh because…well, it is a death machine after all. Finally, I added a couple of random numbers because military machinery often seems covered in numbers that have no meaning to the layman. Final verdict – I’m so pleased with this guy I’m thinking I might have to strip down some of the earlier ones I’ve painted and give them another go. For the moment, I think I’ve got a new commander for my Legion. The door chime sounded, and the executive officer stepped in. ‘Indeed. Here’s the clincher though. Apparently, they can’t unlock the door. The whole system is designed so that no one on the inside can end the quarantine, and thus risk infecting others. Only agents on the outside can open it. Agents with the proper code. We are going to have to send someone in who can crack the door lock. And, just to make it all the more fun, while we’ve got a layout of the building, it has suffered some pretty extensive damage. There is no way of telling which pathways are open and which are going to be blocked. ‘The volunteers love a challenge’. This scenario is played on a 2.5 x 2.5 table. The table should be divided into a several large corridors. One corridor, around 2” wide, should run around the entire outline of the table. Five more corridors, approximately 4” wide should criss-cross the table, so that the form a number sign (#) but with three, equally spaced vertical lines. Designate one side of the table with the ends of the three vertical corridors as the volunteer edge. The opposite edge is the survivor edge. Place three door on the edge of the table on the survivor side so that they line up with the three vertical corridors. Place another three doors in the exact middle of the three vertical corridors. Place an ammo token behind a random middle door. Place 6 numbered spawn points on the edge of the table. Place four of them along the two unnamed table edges so that they align with either end of the horizontal corridors. Place the other two in random corners of the table. Place the 6 volunteers within 2” of the volunteer table edge. Place 4 blip markers next to 4 different random spawn points. This mission uses blip markers, which can be any little token. Blip markers move just like bugs. As soon as they are in the line of sight of a volunteer or survivor, the blip maker is converted into bugs. Roll a d6 on the Blip Table below and replace the marker with the designated number of bugs. All of the bugs should be placed side-by-side if they will fit. If the blip was moving when it was converted, the bugs may continue to move using whatever movement the blip had remaining. The doors in the middle of the table opened automatically as soon as any figure or blip moves adjacent to them. Once opened, a door may not be shut. Whenever a volunteer reaches one of the three doorways on the survivor table edge, they should roll a die. On a 7+ they have found the door that accesses the survivors. On any other roll the way is blocked. If two doors have been checked and both were blocked, the third will automatically access the survivors. When the access door has been found, the volunteers must unlock it. Any volunteer in contact with the door may sacrifice either their move or shoot action (but not both) to attempt to unlock it. Roll one die, on a 10 the door is unlocked. This is reduced to a 5+ if the figure is a tech wizard. The player may reroll this die by playing the ‘Clear Transmission’ Heroic Action card. Once the access door is opened, place 9 survivors adjacent to it. To escape, the volunteers and survivors must exit the table at any point along the volunteer edge. Treat that edge as the dropship for determining survivor movement. In this scenario, bugs or blips will always move towards the closest volunteer or survivor if it is within 16”, even if it is not in line of sight. Otherwise they move randomly. At the end of every turn roll 2 six-sided dice. Place a blip marker next to the spawn points indicated on the dice. If you roll doubles, place one blip marker next to the indicated spawn point, and also compare the doubles rolled to the Unexpected Event Table below. Ammo. One random player gains an ammo token. Ceiling Collapse. A big chunk of ceiling collapses and squashes one bug of the player’s choice. Remove that bug from the table. If there are no bugs, it squashes a random blip instead. Adrenaline. One random player may draw an extra Heroic Action card. Sprinklers. Something sets off the sprinkler system. Maximum line of sight is reduced to 12” for the rest of the scenario. Armoured Bug. Place an armoured bug next to a random spawn point.